BSkyB's CEO insists life is sweet: customer numbers are up, the BBC's on the back foot and the desire to innovate and evolve is as strong as ever. 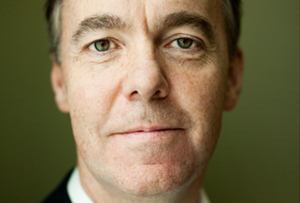 MT first came across Jeremy Darroch in the spring of 2007. We'd been summoned out west to Osterley for a rare audience with his boss, James Murdoch, BSkyB's CEO, the young heir apparent to the News Corp global empire. While Murdoch had a preparatory cigarette on the balcony, I was hurried along a corridor at New Horizon Court. Darroch, then Sky's finance director, was in his big office staring intently at his screen. He looked up with a careworn and slightly melancholic mien. A lot has happened to both Darroch and Murdoch since then: mostly good for the former, not so great for the latter. Darroch has a reputation for being close to Murdoch, a bright, thorough and trusted lieutenant who tempered some of his energetic boss's schemes and excesses. Legend had it that together they'd dreamt up the brazen December 2006 raid on ITV shares on the back of a fag packet: the dynamic duo rustled up £940m for 18% of the company in three days flat and finally stymied Richard Branson's chance of ever being a bigtime player in British television. One version of the story has it that consiglieri Darroch had advised 15% of ITV would have been enough to do the trick without arousing the unwelcome attention of the Competition Commission. But James really wanted Branson out for the count and biting the dust. James, together with Darroch, changed the outlook and culture at Sky beyond recognition. Externally, they changed it from a one-product, pay-TV broadcaster shifting set-top boxes to a triple-play, multiplatform communications operator, offering TV with new technology such as high definition, telephony and broadband. Internally, their management practices were far more enlightened and 21st century. They looked carefully at employee engagement, were one of the first to climb aboard the CSR bandwagon with any sincerity and became class leaders in carbon reduction. Then suddenly, in classic, capricious style, James was shifted by his father to run the whole of the News Corp business in Europe, including, fatefully, the News of the World. Darroch became the first internal candidate in Sky's then 18-year history to get the top job. If his predecessor got the job through blue-blooded entitlement, the same could hardly be said of Darroch, whose father was a tax manager and grandfather a Northumbrian miner. And he puts in the hours without going mad, leaving the house at 7.15 and departing the office between six and seven. He spends most Sundays at home in Surrey reading work stuff. The last year, however, has not been plain sailing. Rupert and James Murdoch wanted to buy the whole company and the proposed takeover became a massive, interminable punch-up, with Murdoch-haters coming out of the woodwork in droves. Other media owners - from the BBC, through to the Guardian and Associated Newspapers, which owns the Daily Mail - joined forces in an attempt to derail the bid. Then, of course, came the Millie Dowler phone-hacking revelations and James Murdoch's involvement in the scandal. The whole bid came crashing down. Darroch clearly loathes all the politics and regulation that comes with the UK media and notes it's a dangerous distraction from keeping the show on the road. He'd love just to be able to run his interesting and highly successful business. But that's not the way it can ever be. He is stuck with it. So how had the past year been? The whole episode must have been hugely disruptive as the soap opera played out. One could argue that had the bid succeeded it would not have been to Darroch's advantage. A lot would probably have changed. He would have been even less his own boss and an amalgamation with Sky Italia and Sky Deutschland - both lesser businesses - would have been inevitable. Did he really want Rupert endlessly on the phone, as he was to Andy Coulson? This is all very well, but the whole episode must have been highly destabilising and continues to be now. What about all the members of staff who, whatever they thought about being a 100% Murdoch organisation, had been quietly working out the size of their windfall if the share price had gone to £9 or even more? That was an attractive bonus to which they had to kiss goodbye. Shareholders in BSkyB have always had a rollercoaster of a ride and a number of them are a bit queasy. First, they, too, were eagerly awaiting payday if and when the News Corp bid finally went through after numerous regulatory delays. The vile stench emanating from the News of the World lair in Wapping put paid to this juicy liquidity moment and, immediately the bid was withdrawn, the share price fell back. So an annoying pre-bid Murdoch Discount went to being a wild Murdoch Premium and then back to a discount again. Blame for this is put at the Murdochs' door. But, at the same time, with 40% of the stock, News Corp remains a major shareholder, which prevents anyone else from stepping in. It's bid-proof. Second, the influence of News Corp must have been diminished by events. In the current political climate - with a government no longer cowed by the Sun and the prime minister no longer taking calls from the Sun King - a further tightening of the rules about foreign ownership of media organisations could mean a further dilution of News Corp's shareholding. And News Corp has its own disgruntled shareholders. So some shareholders are cross, and at the forthcoming November AGM there could be a bumpy ride for the company chairman, which might, in turn, put Darroch in a dicey position. This is basically true. They are hyper-competitive at Sky but culturally light years away from tabloid hacks and PIN numbers, an old, inky media world they regard with some disdain. It's interesting that when Sky had its own mini-scandal earlier this year about sexist banter by sports presenters Andy Gray and Richard Keys, they were shown the door pretty rapidly. 'Their behaviour was so far across the line of what was acceptable, they had to leave,' says Darroch. It's hard to underestimate the mess in which James Murdoch now finds himself. Coulson is said to be expecting to receive four years, even from a relative fair-minded judge. But, chat, speculation and prison sentences aside, what remains at Sky are the fundamentals, which are pretty impressive. Since 2007, when Darroch became CEO, revenue has risen from £4.6bn to £6.6bn. Free cash flow - what Rupert Murdoch more than anything else was desperate to get his hands on - has risen from £454m to £869m and is predicted to reach £1.3bn by 2013. Customers are up from 8.8 million in 2008 to over that magic target of 10 million, and the money they are spending - the average revenue per user (Arpu) - is up from £421 annually to £535. The endless war with the BBC goes on, but now Sky has the upper hand. The BBC is suffering from harsh budget cuts, which it handled in a hamfisted manner, and poor morale. Sky News' coverage of the two big events of the summer - the UK riots and the Libyan insurgency - wiped the floor with its old adversary. And Sky has muscled in to share coverage of Formula One because the Beeb cannot afford the huge cost alone any more. It's even pinched the blessed David Attenborough and then won a Bafta with his Flying Monsters show. But threats continue from all over. Just after MT met him, Darroch was faced with the 'pub landlady' ruling from the European Court of Justice, which appeared to threaten Sky's basic business model - making shed-loads of cash from Premiership football - as the European judges said she could show games at her Red, White and Blue establishment in Portsmouth using a hookie Greek pay-TV card. This is a complex copyright issue which now needs to be decided by the UK courts, but Sky appears relatively relaxed about it. If Sky has a problem it's perception-based. There remain elements of society for whom it is as unloved as Tesco. It needs to grow with more emotional intelligence into the role of being the biggest gorilla in the room. It cannot play the role forever of being the bantamweight outsider, constantly jabbing at the British media establishment and pretending it's always the challenger. At telephony rival Talk Talk they refer to Sky as 'The Death Star' and it's happy to live up to the image: James Murdoch has a life-sized model of Darth Vader outside his office. Sky is the crowned monarch of UK media and needs to accept the role with grace and maturity, although with a Murdoch in its chair this is never going to be easy. Darroch doesn't go with this. Can he win over the Guardian-reading chatterati? 'Yes. We can and we want to. That's why, for example, we sponsor the Hay Festival. Nobody was expecting that and we did a good job. You just need to decouple media conversation - especially conversation about media - from the real conversation with our customers. Our business speaks to the heart of British family life. In Manchester and Newcastle not just in London. And our job is to create more converts.' There's mild- mannered Northumbrian zealotry for you. News Corp bid for 100% ownership of Sky is dropped following phone-hacking scandal.